The breeding program that would result in the Sterling variety started back in 1990. The efforts to breed the variety all started after a plant pathologist by the name of Dr. Cal Skotland discovered that the original Saaz stock that the U.S. had obtained from Czechoslovakia in the early 1980s was infected with a destructive pathogen called Prunus necrotic ringspot virus (PNRSV). At the time, the Saazer hop variety was in pretty high demand by brewers both large and small, but supply was sporadic and the price was often quite high. In hopes of relieving some of the uncertainty around the variety, the U.S. obtained a small amount of Saazer planting stock. 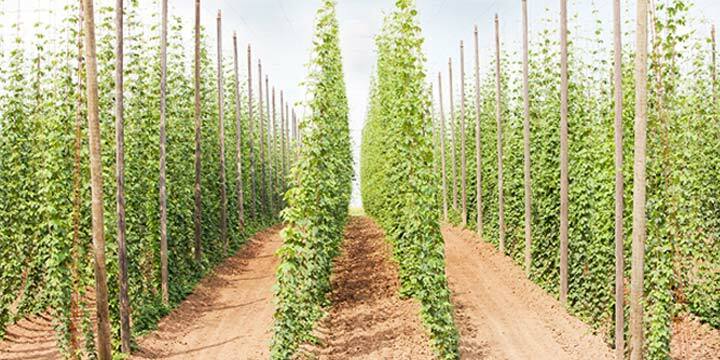 The first hop farm to begin planting the variety was the Anheuser-Busch owned Boundary Farm, which happened to be at similar latitude as the Saazer growing region in Czechoslovakia. It was at this time that Dr. Cal Skotland made his discovery. In 1990, Dr. Al Haunold, arguably the most famous hop breeder, was able to acquire uninfected Saaz clones. 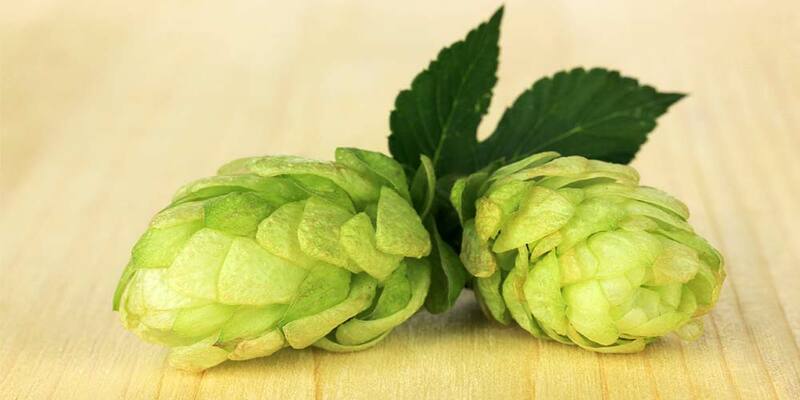 This prompted a breeding program with the goals of creating a higher alpha-acid Saaz-like hop variety, with better disease resistance and a higher yield. To this end, Haunold crossed a Saaz female with a male who’s ancestry included Cascade, Brewers Gold, Early Green, and several other German aroma varieties. Sterling’s genome is around 50% Saaz and 25% Cascade. The other 25% is a magic mix of other varieties. Coors showed some interest in Sterling early on, but according to the above reference, their interest waned soon after being lit. It’s unclear why, but has long been rumored that it was due to the work of an over enthusiastic farmer liberating some of the test rhizomes, planting them, and then harvesting the crop before it was ready. Sterling was officially released for commercial use in 1999, and quickly made a splash in the craft beer world. Though newer proprietary varieties may be more popular, especially on the aroma side of the boil, Sterling has managed to hold a pretty consistent cut of the acreage in Oregon (PDF); averaging 221 acres and a yield an of 1,459 lbs. per acre over the last three years. The Sterling variety is a commercial cultivar with no restrictions, which means that rhizomes and plants are readily available early in the spring for those looking to start or add to their hop garden. Sterling hops are not tolerant of wet soil, so be sure you plant them in a well-draining location. Its affinity for mild winters and drier soil may make it a good choice for those living in the southwest United States. Once in the ground, the plants will take about two years to establish and begin producing. Bloom time for this hop is June through July, with a harvest time of mid-August into early September. It may develop chlorosis (a yellowing of the leaves) during very hot summers. Sterling is one of the first varieties to go dormant after the growing season. Keep in mind, Sterling probably won’t be the best variety for most hop growers. 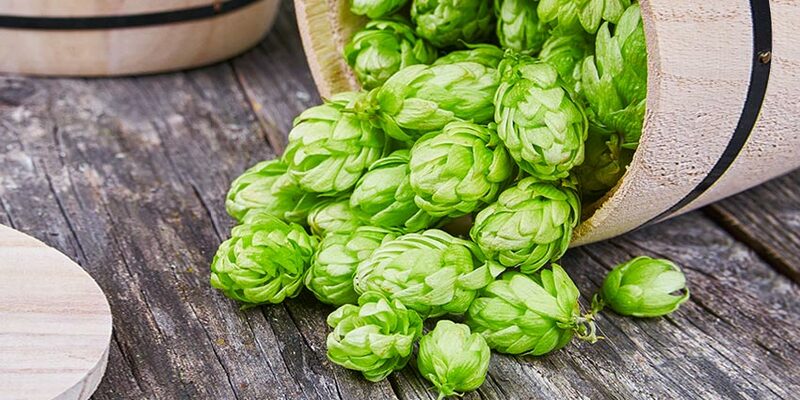 Before you give this one a try, it may be wise to check with your local homebrew supply or other hop farmers in your area to see whether this variety will grow well in your area. Sterling’s high franescene content makes it slightly more pungent that its Saaz mother. It brings an enticing mix of musty earthiness, rustic herbal spiciness, and whispers of floral fruitiness. Its herbal and spicy characters are often described as tea-, tobacco-, or pepper-like, while the fruity qualities take the form of citrus, particularly lemon and pineapple. Sterling shouldn’t be hard to find in either pellet or whole cone form. There’s a good chance your local homebrewing supply will have pellets, if not whole cone, in stock. Sterling hop pellets are exceedingly easy to order online. Though, whole cone will likely become harder to source the further it is away from harvest season. 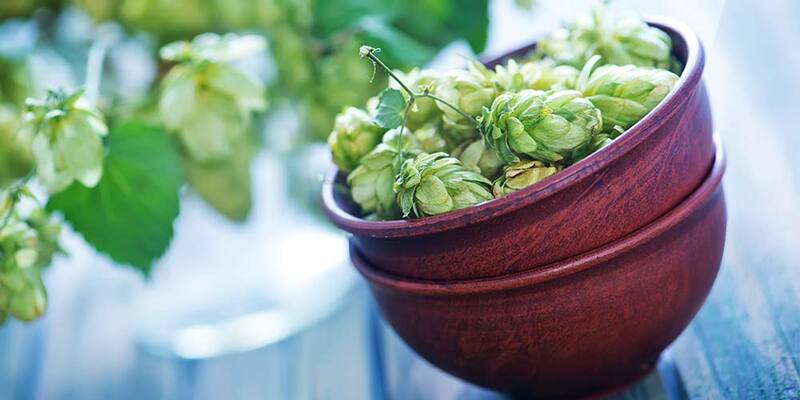 How you use Sterling hops depends heavily on the type of beer you are making. It has enough bang to be used as a dual-purpose variety in most styles. However, if you’re brewing a style with high IBU’s, you may want to consider pairing it with another higher alpha-acid variety. Used alone, you’d have to use a lot of it, which could potentially add harshness and vegetal flavors to the beer. Of course, you don’t want to overwhelm what it contributes either, so be wary of pairing it with varieties that are overly pungent. To get the full qualities of citrus and noble herb, be sure to dry hop this variety. It’s the franescene oil that contributes these flavors, but franescene is completely lost during any hot side additions. Sterling is best suited to Pilsners, Lagers, Goldens, and Saisons; lighter styles where the subtlety of its aroma and flavor won’t be overshadowed by other bolder flavors. Sterling is a great substitute if you have a recipe calling for Saaz and, for one reason or another, you can’t source any. Or, if you need a substitute for Sterling, give one of these varieties a try. To help you gain a better idea of this hop’s aroma and flavor, I would recommend you sample as many of these as you can find. This, “research” will deepen your understanding of how Sterling works in various beer styles, as well as give you a better idea of how to use it in your own recipes. 2018 Oktoberfest from Sierra Nevada Brewing (USA) — Also uses Splater and Record. Polestar Pilsner from Left Hand Brewing (USA) — Also uses Magnum and Mt. Hood. Bombshell Blonde from Southern Star Brewing (USA) — Also uses Saphir. Oktoberfest from Old Bakery Brewing (USA) — Also uses U.S. Magnum and Crystal. Hopzeit from Deschutes Brewing (USA) — Also uses Herkules and Hull Melon (read our review). Tangerine Express IPA from Stone Brewing (USA) — Also uses Citra, Centennial, Azacca, and Mosaic. Five Fin from Pelican Pub & Brewery (USA) — Also uses Centennial, Mandarina Bavaria, and Magnum. If you have any experience brewing with Sterling hops or have tasted beer that make use of the variety, let’s hear your thoughts down in the comments below.